Wedding Videographer Miya and Salvatore Same Day Edit Video- Polished Perfection Wedding Same Day Edit (SDE) – Wedding Videographer Life Studios Inc.
What an awesome treat we had being able to capture Miya and Salvatore’s Wedding Cinematography. As true love, always prevail, even the rain turned into a beautiful thing on their wedding day! It was certainly a celebration where traditional and modish meet- definitely a Polished Perfection! Big Italian Weddings are always a highlight for us! We love their unique way of celebrating life. It is truly very uplifting! Also, we enjoyed the very friendly atmosphere and witnessed how bonded their families are! All together they make every single soul joyful! Miya and Salvatore are two gorgeous looking pair. With her smile, she can mesmerize you; with her love she surely captured her man’s heart. Miya is everything that Salvatore ever wanted. Our stunning Bride walked down the aisle with her radiant smile in her exquisite Vera Wang dress (same as Chrissy Tiegens) that surely wowed everybody especially her striking Groom! It was a priceless moment when Salvatore couldn’t hold back his tears as he waits for Miya. Two hearts united in front of God, family and friends at Saint Helens Parish in Burnaby. The big colourful reception was held at the Italian Cultural Center. The combinations of draping, perfect lighting, crystal chandeliers and candleholders, purple tones, white cake with pearls and live music were really sophisticated and elegant! This wedding was surely another home run for us! Here’s a story of two hearts coming together as one with so much love for family and friends! 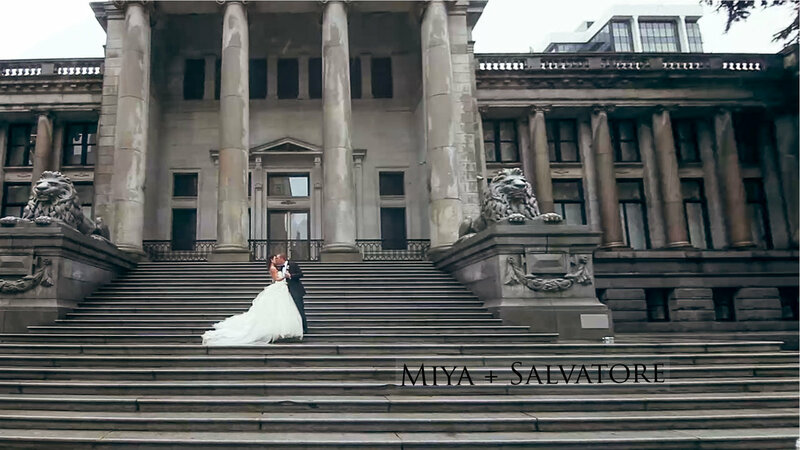 Enjoy Wedding Videographer Miya and Salvatore Same Day Edit Video!